Thanks to the most recent round of federal TIGER grants, our city will now have slightly over $10 million along with matching funding from other sources to spread across three projects, connecting our trails and improving a few trouble spots. These funds are going to further help the city’s ‘Closing the Gaps’ plan, which aims to make connections to North and West Philadelphia easier to access for cyclists and pedestrians. “This grant will support fantastic projects across the City of Philadelphia which will ultimately improve quality of life for our residents,” said Mayor Nutter in a press release. As reported by Plan Philly, this money will be going towards the development of the rusting and derelict Schuylkill River Swing Bridge into a connecting path between the soon to be completed Grays Ferry Crescent Trail and Bartram’s Mile Trail. 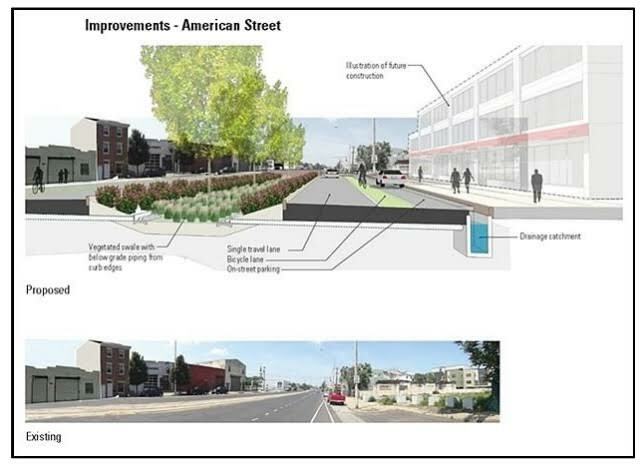 The next and much-welcomed improvement will be going in across town on North American Street between Girard and Lehigh. These will include the installment of a designated parking lane for cars, a bright green lane for bikes and the train tracks will converted to an area for trees that will separate the two travel lanes. The smallest, but equally significant improvement for road conditions will be at Westmorland Street in North Philly which will bridge the gap over and over-grown section of 4th street which currently only has a pedestrian bridge. “The Westmoreland St. project is a huge win for residents of this pocket of North Philadelphia. This new roadway will promote multi-modal neighborhood connectivity and remove a safety and security risk that is a major blighting influence in the community,” said David J. Perri, Commissioner of the Philadelphia Streets Department in a press release from the mayor’s office. The $10 million in grants from TIGER is only a small part of the funding for these three projects. An additional $24,755,000 will be coming from the city and state along with The Delaware Valley Regional Planning Commission and the Schuylkill River Development Corporation. The Bicycle Coalition is always happy to see improvement to cycling conditions on our streets. But we question the proposed design of cycling facilities on the wide stretch of road of North American Street. According to the plans, the bike lane will be running between a parking lane and the travel lane. We believe this road is ideal for the same design of protected bike lane soon going on Ryan Avenue between Lexington Avenue and Rowland Avenue. That lane will be the city’s first fully protected bike lane and will be separated from traffic by a parking lane and bollards. “Go for broke and get the best of the best on American Street,” the Coalition’s director of research John Boyle said in reaction to the plans. We’ll be analyzing these plans and sharing our requests for safer streets over the coming months. Since the program’s inception, it has played a vital role in the region and has awarded just over $77.8 million total to the area. Of that amount, $27.4 million has gone directly to improvements of cycling infrastructure in Philadelphia. It began with the 2009 round of funding when $17,200,000 went towards improving and building eight separate pedestrian and baking paths. These projects included the pedestrian bridge on the Schuylkill Banks, enhancement of biking and pedestrian facilities on Walnut Street Bridge, the creation of Bartram’s Garden Trail and the Delaware Avenue trail. The benefits of this program have also been felt in other areas of the city throughout the years. 2010: $15 million Dilworth Plaza and concourse improvements. 2011: $10 million for 100 traffic controllers to improve traffic flow and safety along Castor/Oxford Avenues, Bustleton Avenue, and Woodland Avenue. 2012: $12,862,699 for improvement of Wayne Junction power substation which powers much of SEPTA’s transit systems. 2013: $10 million to SEPTA to separate passenger and freight rail lines on SEPTA’s west Trenton Regional rail lines. 2014: $2,500,000 for a study to find possible improvements for multimodal transportation of Roosevelt Blvd. Sadly, the $500 million that was available to TIGER for grants in 2015 has been drastically slashed by 80% to $100 million in 2016. This may make it more difficult for future funding assistance to make it to the area, but our fingers are crossed.